BLOOMINGTON, In. - Shahzeen Attari has been named by Science News as one of 10 early- and mid-career scientists on their way to widespread acclaim for tackling big questions facing science and society. 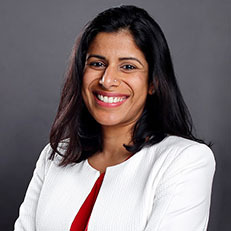 Attari is an associate professor at Indiana University’s School of Public and Environmental Affairs (SPEA) and an expert on human behavior and resource use. Her current research focuses on motivating climate action by fusing facts and feelings as well as understanding and correcting misperceptions of energy use. Attari has been a member of SPEA's faculty since 2011. She and her lab work on a range of research topics that span perceptions, motivations, and biases of how people understand complex systems and use natural resources. Her work has strong links to both cognitive science and environmental science and has been published in top journals such as the Proceedings of the National Academies of Sciences. Her research has also been summarized in a variety of venues, including the New York Times, The Economist, and BBC. Attari was named a 2018 Andrew Carnegie Fellow and recently completed a fellowship with the Center for Advanced Study in the Behavioral Sciences at Stanford University. Each scientist included in the SN 10 was nominated by a Nobel laureate or recently elected member of the National Academy of Sciences. All are age 40 or under, and were selected by Science News staff for their potential to shape the science of the future.